Happy Hump Day Everyone! I can not believe it is Wednesday already. 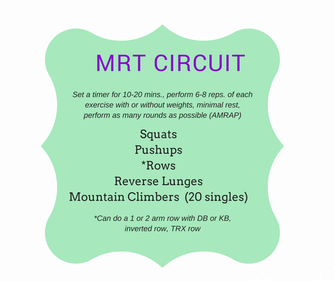 I have a simple, effective MRT Circuit workout for you today. MRT stands for Metabolic Resistance Training. MRT training is "HOT" right now. This form of training, if done with intensity, takes the place of boring cardio workouts. You DO NOT have to spend hours running or at the gym. I can attest to this as I was a cardio queen, more like a running queen for so many years. This past year I have been forced to try relying on MRT Circuits with a little running (1-2 days) sprinkled in. I am leaner and stronger than ever before (as long as I eat what I am supposed to:). I hope you can learn to trust me on this and give MRT training an honest try. Those of you short on time, this is the training you need to adopt. Better yet, you can do many circuits without any equipment if you are not interested in purchasing any for your home. If you have a gym membership you can easily do these at the gym. If you travel, these are incredibly simple to do in a hotel room (the bodyweight versions). Stay tuned as I plan to post a body weight MRT circuit next week. Let's break this workout down. Depending on your fitness level you can set a timer anywhere from 10 minutes to 20 or 25 minutes. Obviously the more rounds you complete the more metabolic effect you will get (your after workout caloric burn). When I first started MRT workouts I set a goal to complete 3 rounds and now my goal is at least 5 rounds. In this particular workout I have you completing 6-8 reps of each exercise (exception being the mountain climbers with 20 singles). Pick your rep range and it may change as you go through your rounds. Rest is another huge component to MRT. You want to aim for the least amount of rest possible. You may need to work on this and that is ok. For now, rest enough that you perform each exercise safely. My goal is to rest only 15-30 seconds after each round, not between exercises. I apologize for not having links or photos for each exercise. Please email me at kmaxfit@gmail.com if you have any questions regarding this workout. I am working on creating photos and videos for every exercise I put out on my blog. Make today count! Do your best to be and give your best today and everyday!